Like a good fight? Always rooting for the little guy? Saving damsels in distress kind of your thing? Then this game is definitely for you. Fight as a small but fearless knight, wielding a sword almost bigger than you, to save as many princesses as you can in Knight Blitz OMG from Cloud M1. Hack and slash is kind of the name of the game here, though be warned, slashing the sword seems to pelt you around without the use of the directional pad. This is due to the sword being so heavy but it does affect accuracy. When they say there are, “endless hordes of invading knights,” they aren’t kidding. All of the bucket-headed minions seem to just spawn in big groups out of nowhere so you are constantly hacking and slashing your way around. The spin maneuver is a nice touch, but I rarely put it to good use as I never had time to charge up my character before I was attacked, having to find a new spot and start all over. Be quick and be sure to stay out of the way of your enemies’ sharp blades. 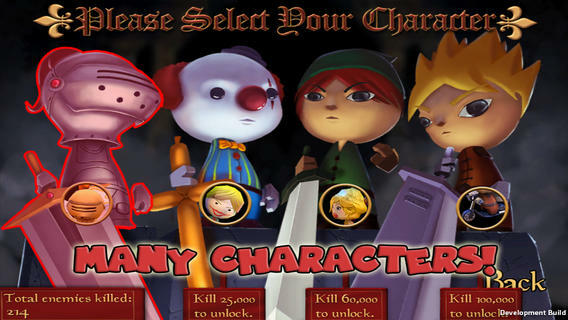 Other characters can be used once unlocked, but you’ll have to kill quite a few enemies to do it. The first one isn’t available until 25,000 kills! Now this is a running total and does not have to be done in one sitting, but that could take some time to do. Or you can take the easy way and unlock all 7 characters with an in-app purchase for only $0.99. 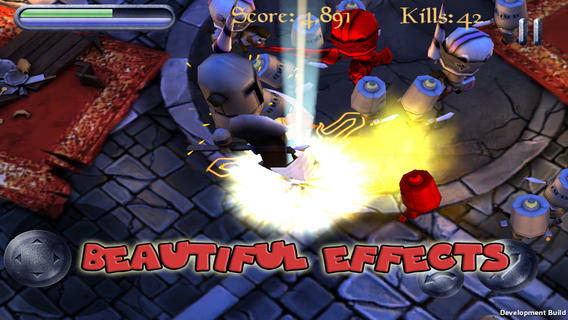 Knight Blitz OMG is a fun and simple time killer. The best part is it’s on sale now for free. It is available now in the App Store and compatible with iPhone and iPod Touch.